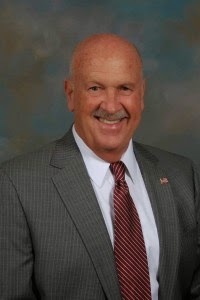 This may be a small town utterance, but one of the best things about living in Ormond Beach Florida is our mayor, Ed Kelley. He is really one of the nicest people I know. From the Ormond Beach Observer-Mayor Ed Kelley and Rick Fraser, executive director of the Ormond Beach Chamber of Commerce, are no longer going on the road. “We found that we could visit just so many businesses in an afternoon, and it was hard to arrange with our schedules,” Fraser said. They plan on meeting at 8 a.m. on the second Monday of each month for about an hour. Fraser said Einstein Bros. Bagels, 110 S. Nova Road, has offered to supply bagels and coffee, and snacks will be provided by Edible Arrangements, 128 N. Nova Road. Kelley said talking to the business executives gives him a good barometer on the local business community, and group discussions may spur new ideas. He said the meetings are beneficial in finding ways to help the business community. Fraser said if business people are interested in attending, they should call him at 677-3454.